King of the hill is our largest Moonwalk / interactive ever!! 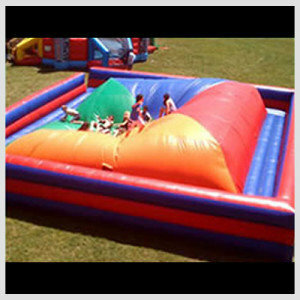 35 X 35 X 11 this is HUGE – challenge your friends to race you to the top and bounce around the top while trying to make your friends slip to the bottom (no pushing or shoving) just the bouncing could make your friends fall. This is My kids favorite by far and an event MUST – If you are planning the best event ever make sure you have this at your next party.